Thanks to the internet and devices like our smartphones, laptops, and tablets, we can now have all the information we need at the touch of our fingertips. Tablets can play a great role in delivering educational material better to the homeschooled students. Apart from that, it can also be used by students for staying up-to-date with the current affairs, research, occasional assignments or projects and much more. 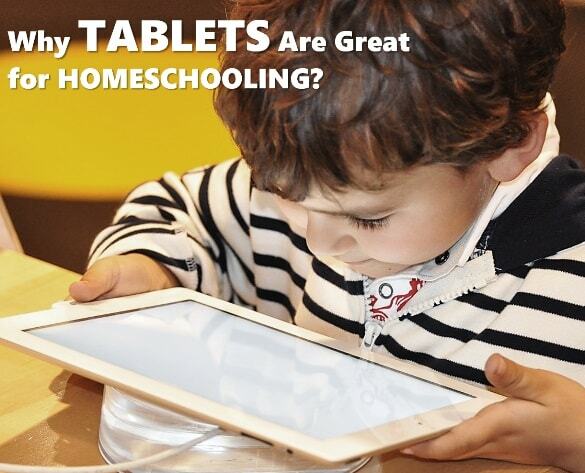 If you are still worried by the question if you should or shouldn’t use tablets for homeschooling your kids’, then let us walk you through how tablets can be great for homeschooling and 7 quicktips for using the tablets in your homeschool. Dig in! Tablets provide a change from the usual daily work to something exciting and definitely adds more interest in learning process much more quickly. And today we are going to know the reasons why every homeschooler should buy a tablet. 1. Aid for children with special educational needs. Not, all of us lead a normal life; there are many children with special needs as well. For instance, there are families that travel a lot due to work. As such the children have to change schools every time their family moves, which impacts their education. Homeschooling is a much stable option for these students as they can continue their studies from any place in the world and a single tablet can carry their entire library anywhere they want. Apart from that, there are many differently able students as well, who needs. Educational needs of these students are outside the scope of ordinary. The Home Tutors Singapore also recommends tablets as an assistive device for children with special needs. There are numerous interactive and educative apps that can aid learning when it comes to differently abled children. There are GPS apps that help with orientation & mobility, and there are other advanced communication apps that can substitute expensive types of equipment. Plus, the accessibility features of some tablets are just remarkable as these tablets can be used by deaf and visually impaired students as well. The generation we live in today just cannot be engaged to learn in the traditional manner by sticking to the textbook learning. Tablets allow us to integrate technology that millennial’s love with the learning process. Tablets also give access to online interfaces that challenge student’s creativity in an engaging and fun-filled environment. There are a wide array of e-learning applications, which are specially designed to take the dull and boring part of learning out of the equation. Tablets not only aid learning, but they also help create interest among students to acquire new things. Tablets contribute to making learning fun and playful by increasing engagement level, interaction, motivation and feedback with positive learning outcomes. Homeschooled students, who miss out on classroom interactions and debated can join study groups online on their tablets and interact with other students from all around the world, discuss various topics and get new insights. 3. Portable and comfortable to use. Gone are the days when students required to read through fat books or visit libraries to get study material. Tablets offer the massive amount of information at the touch of your fingertips. Using the tablets you can easily download and save the books and other study material on your tablet and access them on the go. Tablets are so portable that you hardly need a bag to carry it around. Instead of lugging a large laptop or loads of heavy books, all you need to is your portable tablet, which can give you access to the world’s biggest library. When it comes to tablets, the market is flooded with endless options. You can find tablets of all levels according to your budget and requirements. You can go for a top-of-the-line tablet having a long list of bells-and-whistles, or you can buy an effective and functional unit in a lesser budget. Depending on the brand and style you can buy a tablet starting at $130. Although the cheaper tablets fail when it comes to intense gaming, they do work extremely well for educational purposes, and that is exactly what you are looking for. Right? A tablet can easily offer a great deal of functionality for all the needs of a homeschooled kid without having to invest a lot of money to do so. Tablets are versatile devices, which can be used for many things from entertainment to education or anything in between. These are especially great when it comes to web browsing as tablets enable quick and easy browsing. This amazing feature can be used by students while they are working on their assignments or occasional projects, which requires intense research. You can use tablets as eBook readers, to surf the internet, watch videos or any other task you have for your student. Most of the tablets available in the market allow multiple user accounts, just like PC computers. They also provide customize lists, backgrounds. Email information and much more. So, if you are thinking to use the tablet for more than one student, it can easily be achieved. The multiple account feature also allows parents to control and manage what the child uses, which is the primary concern of parents while deciding whether or not children should be allowed access to internet and technology. You can make a restricted profile, which allows your child to access only selected apps and content. Books are not the only thing that can be downloaded on a tablet. Every tablet is equipped with a marketplace, which allows you to download educational applications, both free and paid. You can find great deals on educational apps related to every subject. That is not it; these applications go beyond basic learning. There are apps that enhance aptitude and logical reasoning skills. There are many other applications for learning music, dance, foreign languages, etc., which can be really helpful for students. Not only this, applications are not just to cater your specific interests but according to specific age group as well. From kindergarten to a college student, there are endless applications for students who want to learn. Although tablets are great devices to aid, education parents must remember to prepare the device before putting these interactive devices into kids’ hands and also to supervise the use. Do share what you thought about all these and if you know anything special to add this, then let me know, I would like to add it directly on this page. Don't forget to share and subscribe out updates.